In many households ground beef is used for spaghetti & meatballs, meatloaf, tacos and burgers, and while those are all great things sometimes you just want something a little different. Since there are so many things to do with ground beef all you have to do is think outside the box. I've had the idea of a Bacon Cheeseburger Calzone, filled bread, etc. in the back of my mind for a while now, and while menu planning I saw this recipe on Rachael Ray's magazine site and thought I'd try it out with a few adaptations. I've made pizza breads similar to this as appetizers, but this was more of a quick weeknight meal than an appetizer, in my opinion. However, that is what I was going for! When my husband tried it, the first thing he said was "this tastes like a steakburger." My response was, "umm... OK..." To which he replied, "which means that it's awesome." (The steakburger he was referring to is one from Steak 'n Shake) I could kind of see that, however I don't think anything will compare to a Single with cheese and a side of cheese fries at 2:00 am! Now, if I do ever plan to make this as an appetizer or snack for a game night or something, I'd use a little less meat and throw in some diced tomatoes. Most people might like pickles in there as well but I have a severe aversion to pickles so no thank you! In a large skillet cook the beef with a few dashes of Worcestershire Sauce over medium heat until browned. Drain and remove to a large bowl. In the same skillet, cook the bacon until crisp. Transfer to paper towels to drain, keeping the drippings in skillet. Add the onion to the drippings and cook over medium heat until softened, stirring occasionally - about 5 minutes. Add onion to beef, then crumble bacon in to mixture. Stir in cheese and season with S & P to taste. 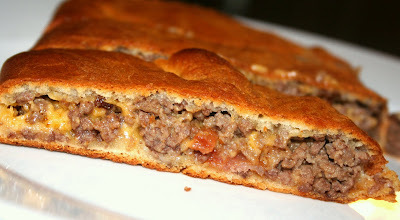 Roll dough in to a large rectangle and cover with meat mixture. Roll the dough (starting with a long side) to make a loaf, pinching seams together. Bake the loaf, seam-side down on a baking sheet for 15-20 minutes or until golden brown.. Allow to sit for 10 minutes before slicing. Yum!!! This looks sooo good. I bet the boys would love to have this at their next sporting event. Thanks for posting.